On The Son Season 1 Episode 4, Eli gathered a posse to ambush the seditionists who were up to no good. Even though they were outnumbered, Eli's group outgunned them and the Mexicans retreated. The seditionists aren't going to stay quiet for long. They have a vendetta and at the top of the list is the McCullough family. Probably Eli more than anyone, but any McCullough will do. They've probably already figured out that the McCulloughs killed Cesar and that has made them even angrier. They want the McCulloughs gone and will continue to cause problems until they get what they want. Do they even realize who they're dealing with? Eli McCullough is not a man to be messed with and if you mess with his family, you're going to be in for a heap of trouble. 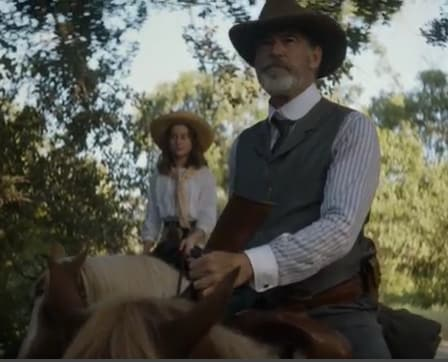 In this clip from The Son Season 1 Episode 5, Jeannie and Eli are taking a horseback ride through the woods talking about the ambush when they come upon something suspicious. Eli confronts the men and learns something horrible is about to happen. It may be that the McCulloughs' past is finally coming back to haunt them. Will they be able to get back to the ranch in time? 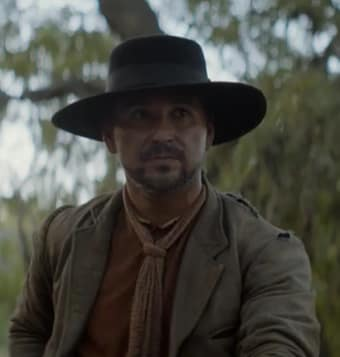 Will the Garcias help them? There are no answers here, You'll have to watch "No Prisoners" on Saturday, April 29 at 9/8c on AMC! to find out what happens! I know I'll be tuning in! If you need to catch up before then, you can watch The Son online right here via TV Fanatic! The Son Season 1 Episode 5: "No Prisoners"
You wanna raise your kids in peace? Try to find a way to change human nature. Permalink: You wanna raise your kids in peace? Try to find a way to change human nature. Pete: Sally, what do you want me to do? Sally: Take responsibility for me and your kids. Put us before your cows. Permalink: Take responsibility for me and your kids. Put us before your cows.